“I don’t know my phone number, “ I lied. “Want to marry me?” he said. “No. I prefer to be single.” I said. “But you need a husband! I’d make a good one! I speak English. I’m his English teacher,” he pointed to my host brother. Then another hour later, a young man came running up to me and was about to open his mouth to likely say, “You have a husband?” One of my host sisters put her arm around me and pulled me away from the young man before I had a chance to hear what he had to say. In one day, I have received three marriage proposals. It was only the beginning of my ongoing journey in receiving marriage proposals and being told by Cameroonian men that I must find a husband before I head back to the United States. On my second day in Cameroon, a Peace Corps Volunteer said that it’s up to us on how we want to handle marriage proposals. Every volunteer handles the situation differently. 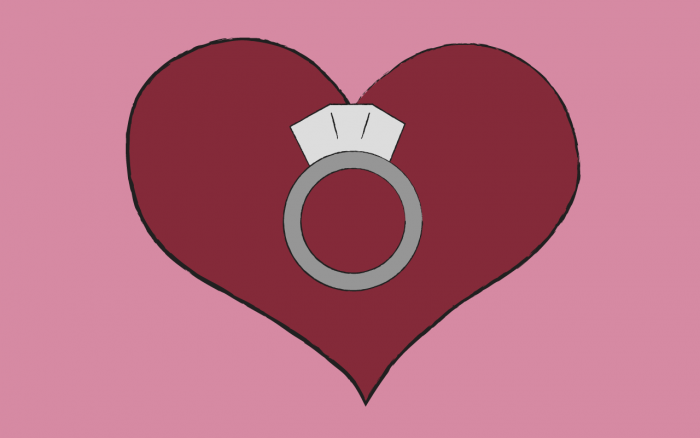 Some choose to wear a ring and create an imaginary husband to avoid providing an explanation. Others choose to be open by telling that she is single and explaining why she choose not to be married. Because one of Peace Corps’ three goals is to teach the host country nationals about the American Culture, I decided to be open with people about why I am not married and many Americans marry later in life. But that was short lived. Once I moved to Bamenda, a city that is much larger than Mengong, the conversations reappeared. Due to the large size of the city where I’m just a blur, marriage proposals and Cameroonians’ quest to find me a husband only continued to pop up frequently even long after I’ve officially become a girlfriend of a lovely gentleman who also happens to be a Peace Corps Volunteer. “I prefer to be single. I’m here for work.” This response was my way of trying to keep the conversation brief. “Two more years,” I said. “No, but I’m already taken,” I said. This young man and I got into a deep conversation about the ethics of marriage and whether or not people should be married for religious or financial reasons and whether or not it’s ethical for couples to be in domestic relationship for many years. In Cameroon, there is such a strong belief that marriage is an obligation and that if you’re an adult and not married, something is seriously wrong with you. They will question singles and those who are in a relationship why they are not married. Many Cameroonians like this young man believe that being in a domestic relationship is unethical and people who are not married legally do not have a good relationship. I countered his argument by explaining that marriage is just a document signed by the couples. I explained further by stating that what determines a good relationship, whether they are married or just in a domestic relationship is how the couple interact and communicate with each other and show love for each other. I threw in Angelina Jolie and Brad Pitt, celebrities who are very well known in Cameroon, as an example of having a successful domestic relationship for years before being legally married. The young man then said that people should marry for religious reasons. I explained to him that the United States is a very culturally and religiously diverse country meaning that everyone comes from different walks of life. Not every Americans are religious and some don’t even belong to a religion. Therefore, many Americans do not marry for religious reasons but marry simply because they want to express their commitment or share certain benefits such as health insurances, mortgages, and bank accounts. I also told him that even if people do marry in the United States, many do not get married until their late 20’s or 30’s. Many people choose to focus on their careers before starting a family. The conversation ended when the young man’s phone rang and he said that he had to go. While many Cameroonians view marriage as a religious obligation, in truth, many propose to me likely because they see it as an easy way to immigrate to the United States and falsely believe that they will become rich overnight. I have often had to explain to them that every Americans live differently. Most Americans are not rich. Many do not earn enough money to live comfortably. Many are struggling to meet their end needs. Some live on debt. Some require financial assistance from the government. Receiving marriage proposals from strangers will always continue…most likely until when I end my service end of next year. While ongoing conversations about marriage with Cameroonians may be exhausting, I always hope that some Cameroonians have become better educated about the American culture after my speaking with them.